This Ongoing War: A Blog: 20-Aug-12: What would it take to make you as happy as this woman? 20-Aug-12: What would it take to make you as happy as this woman? Please spend two minutes and 46 seconds in watching the edited extract of a television interview with the woman who planned and executed a massacre of innocent civilians, most of them children, eleven years ago. Following the killings, she went to her place of work which happens to have been a television studio, and calmly read the evening news bulletin, starting with a report of the massacre that she herself had perpetrated some hours earlier. After an intense criminal investigation, she was arrested less than two months later and charged with the murders of fifteen people, along with a host of other felonies. She was convicted and sentenced to sixteen terms of life imprisonment. But as a result of a controversial and cynical political deal, she was freed (not pardoned) in October 2011 and released to the land of her birth where she has become a major celebrity. Her recent wedding to her cousin, another unjustly freed murderer, received live television coverage and extensive media attention. Not only a celebrity but a hero. Watch how the woman's face radiates the joy that comes from recounting how the death toll grew steadily in the hour or so that she spent fleeing the scene via public transport, unhindered by the police. Absorb the message of how members of the public, unaware the murderer was seated beside them, expressed happiness at the deaths of anonymous children. Imagine the feelings of the families of the innocents murdered by a person like this as they see her achievements celebrated and honored, as they listen to the prideful boasting of an unrepentant killer whose only regret is that she did not manage to kill more. She has confessed over and again since being allowed out of captivity. There can be absolutely no doubt that her deeds are an inspiration to countless others seeking the glory and vindication that her society has delivered to her. The video, which went to air in July and has just been translated and edited by MEMRI, is here. This post continues after the pictures below. Ahlam Tamimi, a very happy person, lives in complete and unfettered freedom in the Kingdom of Jordan from where she has traveled several times in the ten months since her release to such places as Tunisia, Lebanon and Qatar to give public speeches. She hosts a television program of her own that is broadcast by satellite throughout the Arabic-speaking world. She married her cousin in June. 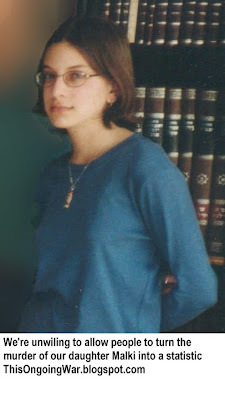 Among the fifteen people murdered by her on August 9, 2001 is our daughter Malki who was fifteen years old. A sixteenth victim, the young mother of a two year old child, has remained in a vegetative state since being injured in the attack. 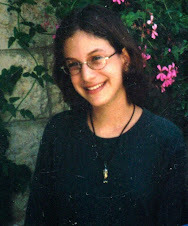 What should a civilized society do in the wake of this woman's story? This is why you can never make peace with these people. I can't help but contrast her reaction and the reaction of the Arab people she spoke of on that bus to the horror,sadness,shock,and shame, most Jews and Israelis expressed that a Jew might have firebombed that Arab cab last week,whicn injured 5 people. My deepest condolences for the loss of your daughter, and condolences to all of the families of those killed and injured by that horrible woman. I can't fathom the depths of hate that would allow someone to be so happy at accomplishing such a heinous act.